The leading pair were the most easterly boats as the seven-strong fleet approached an oil field exclusion zone 100 miles off Rio’s coast, enabling them to continue make headway north for longer while their rivals were forced to tack. At 0330 UTC, as the westerly boats tacked, the teams were practically neck and neck split west to east by around 12 miles. 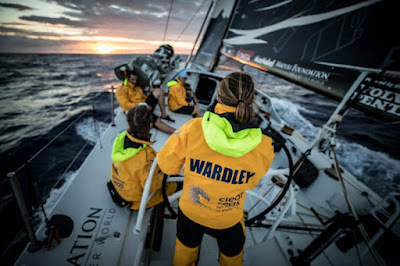 “We have sailed within sight of Vestas for the last 24 hours having lost sight of the others as we all tacked on the shifts around a huge cloud yesterday afternoon,” Turn the Tide on Plastic skipper Dee Caffari said. “There was lots of rain, so much we were either going to grow from being watered so much or shrink from excessive water. Caffari reported a jubilant mood from her crew this morning – all apart from young Brit Henry Bomby, who discovered that he left his toothbrush in Itajai. A 17-mile lead might seem insignificant in a leg of 5,600 miles but it will give Turn the Tide and Vestas 11th Hour Racing a chance to expand the advantage once they hit the south-easterly trade winds in the next couple of days. It is often the case that, in the trades, the rich get richer as they capitalise on better, more stable breeze. The five chasing teams must choose wisely if they are to hold on to the leading pair. Prior to tacking back on to starboard Team Sun Hung Kai/Scallywag were trailing the fleet in the official standings, chasing down team Akzonobel. At 1300 UTC Dave Witt’s crew were up to fourth having overhauled Akzonbel, MAPFRE and Brunel, and pulled back almost two miles on Turn the Tide on Plastic.